This statistic shows the most popular places of purchase regarding pet food in France in 2016. 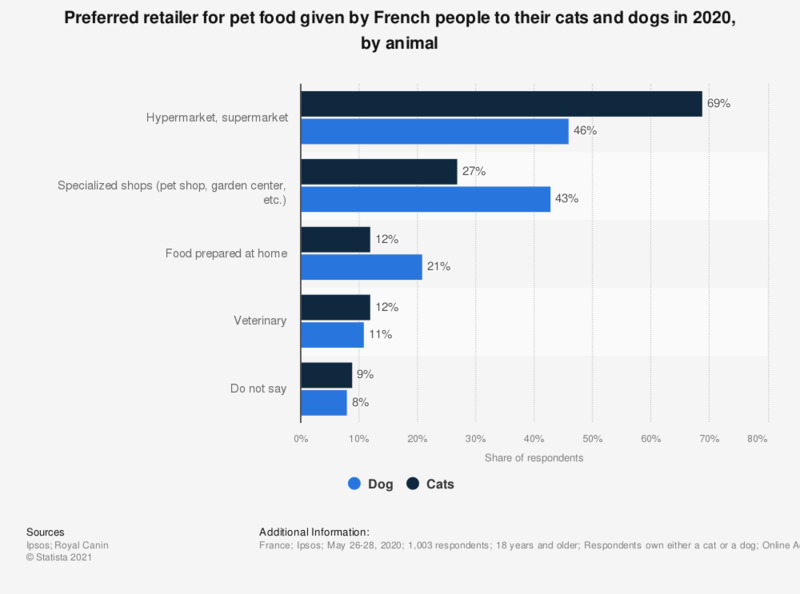 That year, about 25 percent of French respondents bought food for their pets in specialized pet stores, compared to to almost 20 percent who purchased it in garden centers. The source gives no information regarding multiple response options. Statistics on "Pet ownership and pet care market in Italy"
Since how long do you own a pet animal? How did you happen to own an animal pet? Which kind of food do you feed to your dog? Are you willing to sign up your cat to the feline register? Which kind of food do you feed to your cat? Which are the leading criteria do you consider when choosing your veterinarian? Which are the main characteristics that you attribute to your veterinarian? In the past year, how often did you bring you pet to the veterinarian? Which are the reasons why you do not go very often to the veterinarian?